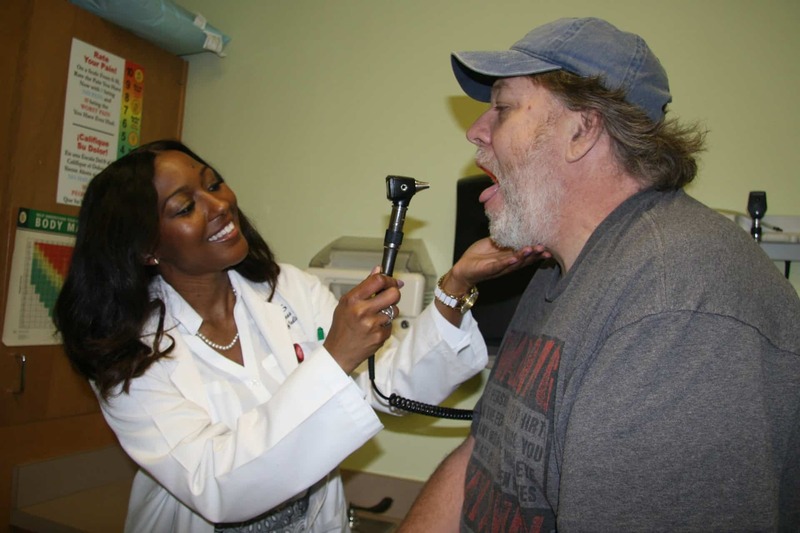 Shaletha Jones, M.D., examines Robert Fascio at the Family Medical Center on the UAMS campus. UAMS recently ranked in the top 10 in the nation for the rate of its graduates who choose to go into family medicine. Feb. 3, 2017 | Feb. 3, 2017 | For the fifth time in nine years, the University of Arkansas for Medical Sciences (UAMS) is ranked in the top 10 nationwide for the percentage of its graduating class to pursue family medicine. In the latest ranking, the UAMS College of Medicine was listed seventh in the nation by the American Academy of Family Physicians (AAFP). The ranked list was based on a three-year average ending in 2015 of the percentage of each graduating class to go into a family medicine residency program accredited by the Accreditation Council on Graduate Medical Education. UAMS was included on the ranking of Doctor of Medicine (M.D.) programs. More than two thirds of Arkansas’ 75 counties include federally designated Primary Care Health Professional Shortage Areas. UAMS has taken many steps to generate more family physicians and other primary care doctors. Moseley and other academic leaders encourage medical students to consider residency training and careers in family medicine, and the college works with private partners to increase funding for scholarships for students who are interested in primary care. Daniel A. Knight, M.D., chair of the Department of Family and Preventive Medicine in the UAMS College of Medicine, said that shortage of primary care providers in Arkansas and nationwide makes this effort more important than ever. In 2016, 56 percent of the UAMS College of Medicine graduating class secured residencies in one of the primary care specialties, which include family medicine, internal medicine, pediatrics and obstetrics and gynecology. Thirty-three of the 163 UAMS seniors who participated in the National Residency Match Program matched to a family medicine residency. The AAFP based its most recent study on UAMS’ three-year average rate, which was 16.3 percent. The one-year rate for the 2014-2015 school year at UAMS was 19.3 percent, well above the national average of 8.7 percent for M.D. programs during the same time period. The one-year rate was an improvement for UAMS, where in recent years, the rate was: 14.6 percent in 2013-2014; 15.1 percent in 2012-2013; 12.6 percent in 2011-2012; and 11.9 percent in 2010-2011. The AAFP highlights programs that are going above and beyond to grow the primary care workforce because of a physician shortfall in this field. As the need for primary care grows, so does the need for family medicine practitioners. The Council on Graduate Medical Education 20th Report recommended that primary care doctors should make up 40 percent of the physician workforce. The most recent estimates from 2008 put that number at 35 percent and declining, according to the AAFP report. Despite the efforts of the AAFP and other advocacy groups, the percentage of M.D. program graduates entering family medicine has remained flat over the last decade. Founded in 1947, the AAFP represents 124,900 physicians and medical students nationwide. It is the only medical society devoted solely to primary care. Family physicians conduct about one in five office visits – 192 million visits annually or 48 percent more than the next medical specialty. Today, family physicians provide more care for America’s underserved and rural populations than any other medical specialty.